Since the rebirth of Apple in 1997 the PC market has had to listen to the constant drone of analysts foretelling the “post PC” world is upon us. It is a common statement made by Analysts that really do not even know what a “PC” is anymore. Well to help some of them do their jobs a little better let’s go back and define some of this for them and then take a look at where the market is and why claims of a post PC era are quite simply a falsehood. Today the world is divided into Apple and the PC with PC usually meaning any system running Microsoft Windows Operating systems. However “PC” was not always an indication of this. Going back to the mid-1960s what was considered a desktop computer was not much more than a calculator with a printer and these had to be custom built and cost a small fortune. In 1968 something magical happened that started the push for smarter systems though. Douglas Engelbart using a massive system showed off what computing could be like in the future. The demo used a mouse, video conferencing, hypertext (web encoding) word processing, email, and more. It is often referred to as The Mother of All Demos. Shortly after this HP, Packard Bell, IBM and Xerox started top build smaller systems that included the computer, keyboard and screen. It was the Xerox Alto that had the User Interface that ended up being borrowed by both Microsoft and Apple to form the basis for Windows and OSX. Once the microprocessor was developed the computing world simply exploded and in 1977 we saw the introduction of three of the computers that built the current market. The Commodore PET, the Apple II, and the TRS-80 from Radio Shack (I actually owned a TRS-80 with a tape drive). Still no matter what these computers were they were considered PC’s. In fact even though Apple decided to break away from the x86 instruction set and used Motorola’s competing design (odd that Apple is now suing Motorola even though they helped give them their start…) and later moved to the PPC RISC instruction set they were still considered PCs. The term used to differentiate the two as IBM Compatible for x86 and Non-IBM Compatible for everything else. This was due to IBM’s massive influence on the PC market throughout the late 70s and early 80s. 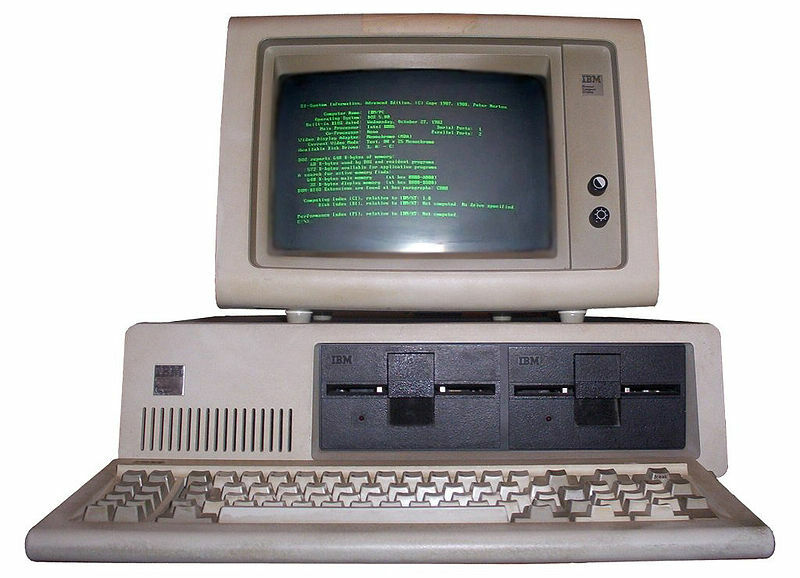 Computer companies started building IBM Clones matching everything from the form factor to the ports to maintain compatibility. Apple did take a very different direction, which ultimately failed after both Steve Wozniak and Steve Jobs left the company. It was only with the return of Steve Jobs and a massive cash infusion from Microsoft that allowed Apple to survive and have their rebirth in 1984. It was after this that Apple began the push to show they were different and/or better than the IBM Compatible “PC” despite Apple computers still be a PC (meaning Personal Computer). It seems that the market and the media has forgotten that the term PC does not mean Microsoft. It simply means Personal Computer which includes Apple, HP, Dell, Asus and too many other vendors to list here. I would love to see this distinction disappear in the media as it perpetuates a falsehood and puts more confusion in the market than needed. Apple is a PC maker that also makes phones and tablets. If there is a “Post PC” era it is one where Apple has failed as well as they make PCs. As we said before the term Post PC Era is a buzz phrase used to push tablets and smart phones as the computing devices of the future even though they are not capable of doing even a fraction of the work that a basic PC can. These devices are companion devices to existing desktops and laptops that allow us to do simple tasks on the go without needing to set up a computer. The fact that PC sales are down is merely the product of people hanging on to their systems longer as there is not the same need to upgrade to deal with new games and software like there was even 5 years ago. The same hardware from two product generations ago is capable of playing games that came out today as more than acceptable frame rates so why bother to upgrade? There will still be refreshes for both Apple PCs and Windows PCs, but these cycles are longer than they ever have been and will continue to lengthen unless there is a massive shakeup in the computing world instead of the smaller incremental updates that we are seeing right now. The tablet and smart phone craze is slowing down, Apple, Android, Blackberry, Nokia’s Symbian and Windows Phone sales are not growing in the same way they were even last year. The market is saturated and will remain that way again, until something truly revolutionary hits the market to shake things up and we are not talking about minor items here. It needs to be something on the order of the original smart phones. Sadly we just do not see anything like that happening any time soon, maybe in 5 or so years, but not just yet. Still until analysts and the media can stop trying to split the market the average consumer will not get a good idea of what the current technology is and it will continue to have a detrimental effect on sales and movement in the market as a whole.